After some early weakness, most US and world equity indexes built gains across August, ranging from a very powerful 9.8% (Brazil), 3.2% (USA - Dow), to -1.3% (Japan). The outlook for September is for continued upside. The Athex was fractionally lower for August, but notably, around 9% above the intra-month low of 1044. Price structure since the start of the year is a rather large bull flag, although there remains strong resistance in the 1300s. 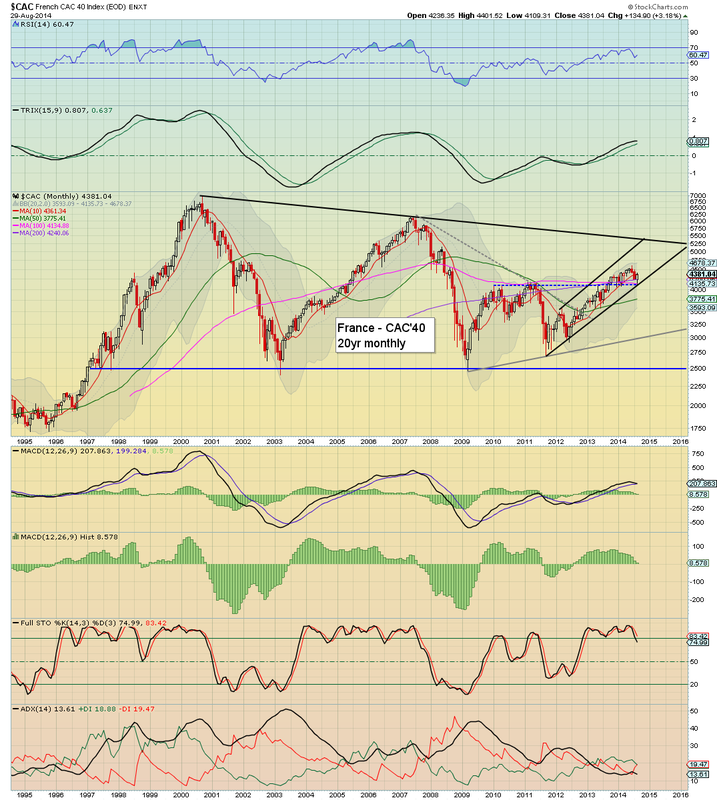 The Bovespa soared a very powerful 9.8% in August, breaking into the 60,000s. Next resistance is around 65k, which makes for a clear 5% of near term viable upside. 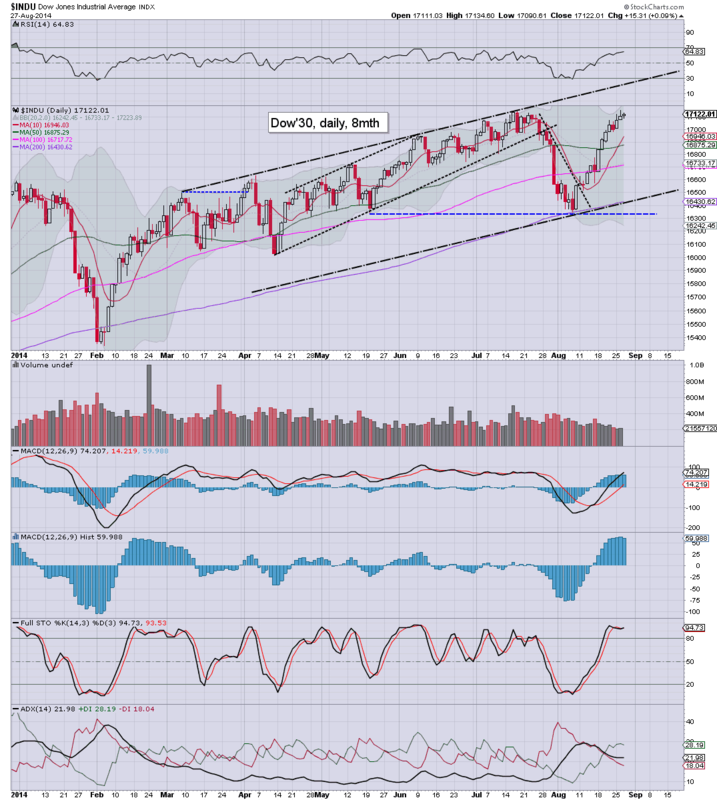 The CAC gained a somewhat impressive 3.2%, having held the somewhat important 4100s. There is viable upside to the giant 5k level within 3-5 months. Equity bears seeking a major intermediate top need a clear break <4k, but that sure doesn't look likely in the immediate term. The economic powerhouse of the EU gained just 0.7%. However the monthly candle is a somewhat bullish spike-floor. The 10000s look viable in September, with 10500 by Oct/Nov. The UK market clawed 1.3% higher, and held above the old resistance/trend that stretches all the way back to late 1999. It is notable that the UK market is yet to break the historic high of 6950. 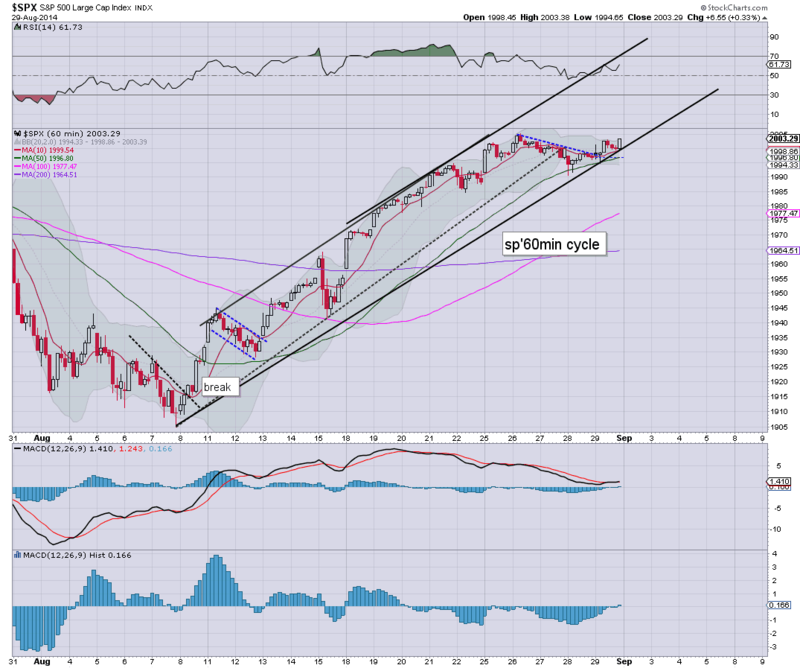 A break into the 7000s would be highly suggestive of a charge to 10k by the end of the current multi-year equity cycle. One of the major EU PIIGS, Spain struggled in August, with a fractional net gain of just 0.2%. 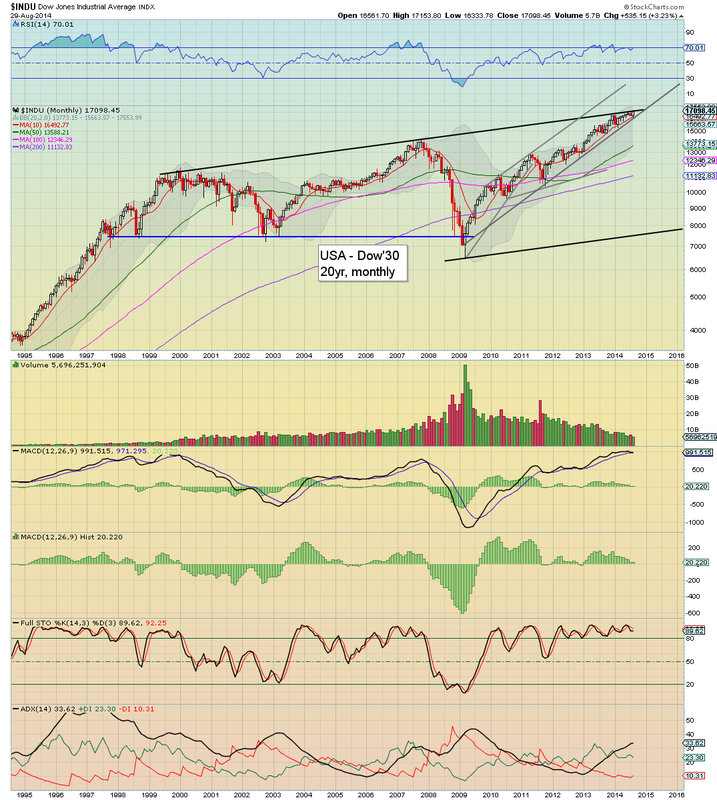 However, like many other indexes, the monthly candle was a rather bullish spike floor, and it bodes for September upside. Next level is 12k, and that is around 13% higher. The Italian market saw a net monthly decline of -0.6%, but that was a clear 8% above the intra-month low. The monthly candle was a spike-floor, and is offering upside in September. Best case upside looks to be around 23k, some 12% higher. 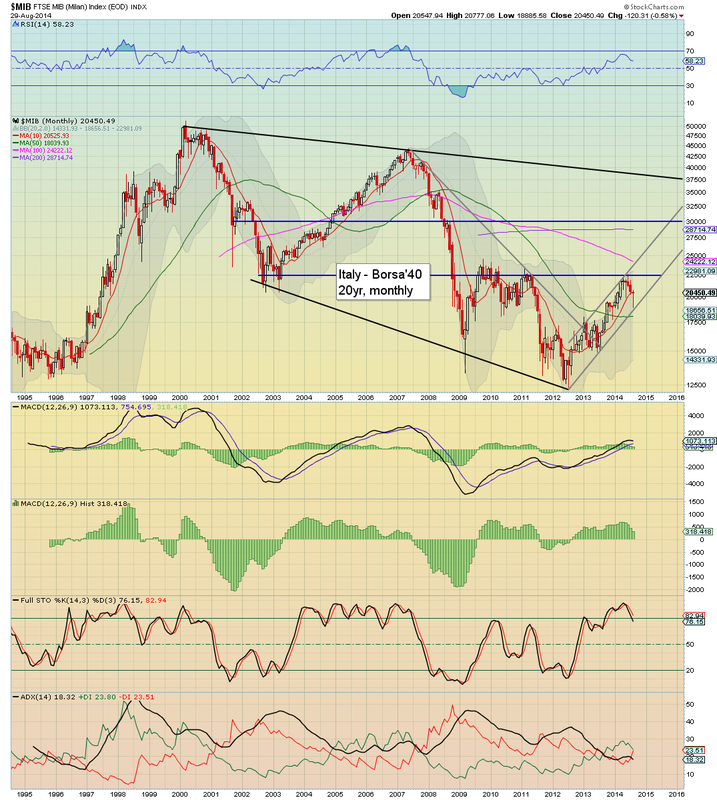 The Japanese market remains weak, slipping -1.3%, and is still stuck under the declining resistance that stretches back some two decades. Underlying MACD (green bar histogram) cycle remains negative for a second month. 16k remains a huge level for the bulls to break & hold over. The Shanghai market only gained 0.7% in August, but it was the fourth consecutive monthly gain - the best run since late 2010. 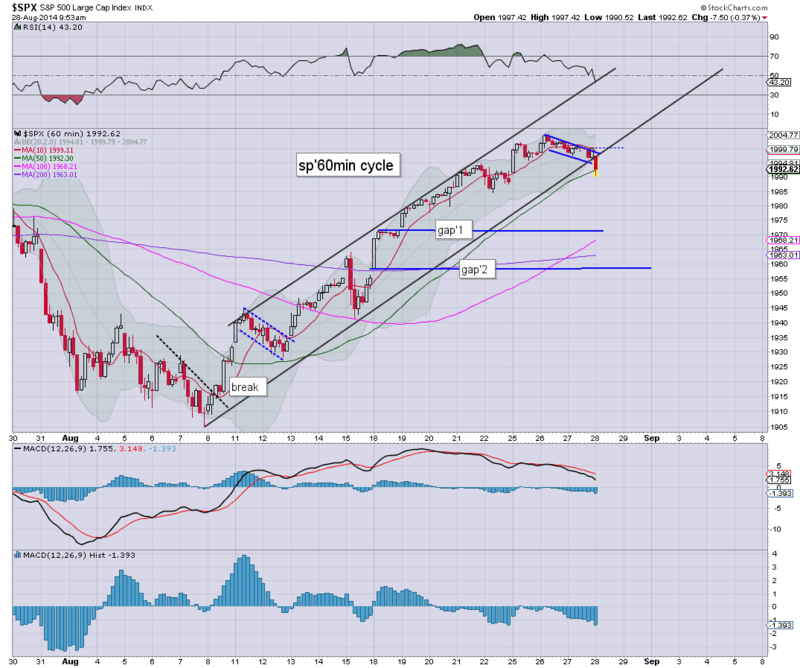 The broader downward channel has been broken, and there looks to be near term upside of a further 5% to 2375. 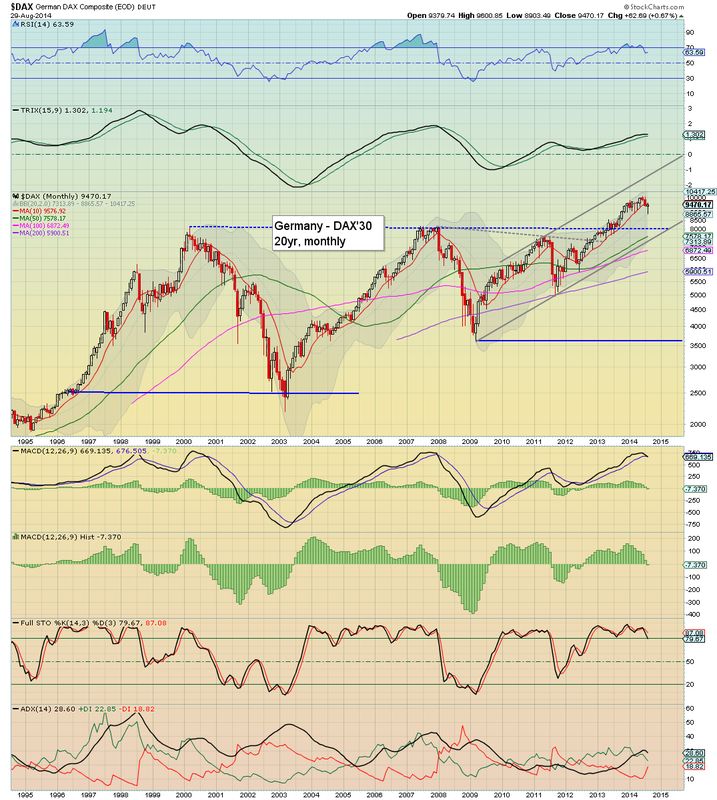 Any monthly closes above 2500, should clarify that 3500 - back to the mid 2009 'post crash bounce', is due. Despite some weakness in early August, all world indexes saw a very significant rebound into end month. Perhaps most notable, there were quite a few spike-floor candles, which certainly are suggestive of further upside into September. Unless equity bears can break the early August lows, there is little reason to be particularly bearish for the remainder of the year. It will of course be a shortened week, with the US market closed on Monday. Tuesday will see PMI & ISM manufacturing, along with construction data. There are a few Fed' officials speaking across Thur/Friday, and as ever.. Mr Market will be listening, notably... Plosser (Fri' morning). All US equity indexes saw strong net monthly gains, with the sp'500 gaining 72pts (3.8%), having climbed from an early August low of 1904 to a new historic high of 2005. Outlook into September is bullish, with a primary target zone of 2030/50. Unquestionably, it was a month for the equity bulls. Even the laggy R2K saw rather powerful gains of 4.8%. With bullish engulfing candles on many of the monthly charts, the outlook for September is bullish.. at least to the 2020s, if not the 2030/50 zone. For me, the only issue is whether the 2100s are coming, before some form of major intermediate correction (on the order of 15% or so). Right now, that is too hard to call, we'll have a much better idea by late September. US equities closed the week with some minor chop, sp +6pts @ 2003. The two leaders - Trans/R2K, settled u/c and +0.7% respectively. 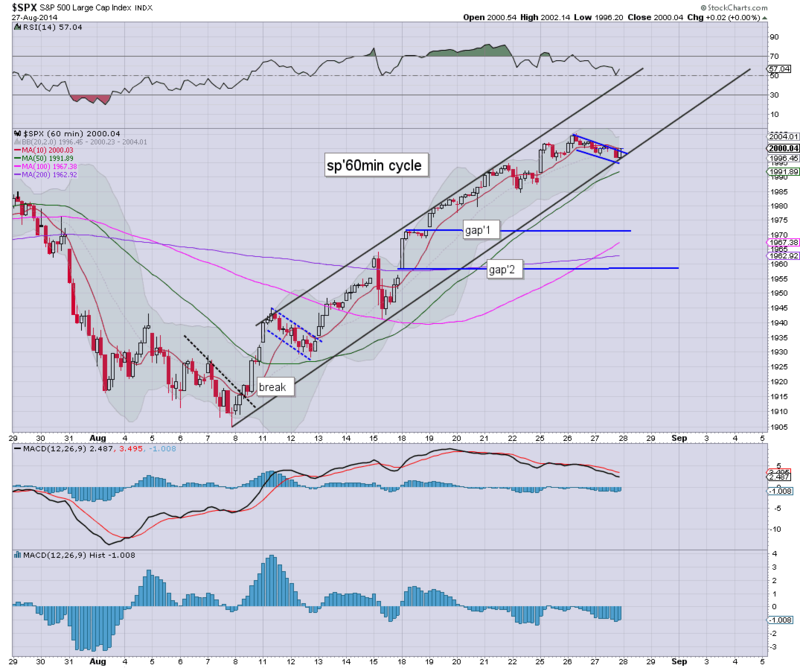 Near term outlook is for the sp'2020s, with 2030/50 in the latter half of September. A bullish month...a bullish week...and most indexes even managed some tiny gains to end the week. There is clearly some way to go to test the upper channel on most indexes, probably another 2-3%. With some underlying geo-political concerns, the VIX held up for most of the day, but was knocked lower into the close settling -0.6% @ 11.98. Near term outlook is for continued equity strength, which will likely keep the VIX within the 13/10 zone. *across the week, the VIX gained a moderate 4.4% . As is often the case, the VIX was duly knocked lower in the closing hour.. ahead of the long weekend. VIX in the 11s remains a bizarrely low level, and reflects a market that has effectively zero fear of anything 'significantly scary' in the near term. VIX 20s look unlikely until at least October. US indexes clawed higher into the holiday weekend, sp +6pts @ 2003. The two leaders - Trans/R2K, settled u/c and +0.7% respectively. Near term outlook is for 2020s next week, with 2030/50 in the latter half of September. ...and another month in the crazy & twisted market comes to a close. It has been a really bullish month, having seen a ramp from sp'1904 to a new historic high of 2005. Daily/weekly cycles are offering the 2020s next week, which seems very probable. Sincerely.. have a great holiday weekend everyone! US equities look set to close the day..week..and the trading month around the giant sp'2000 threshold. It has unquestionably been a very bullish month, with the sp' ramping from 1904 to a new historic high of 2005, along with a VIX that has fallen from the mid 17s. Well, it has been one hell of a month. Many I know were touting sp'1860s at the start of the month.. we never got there..and with a break above the giant psy' level of 2000, Mr Market continues on a very bullish path. 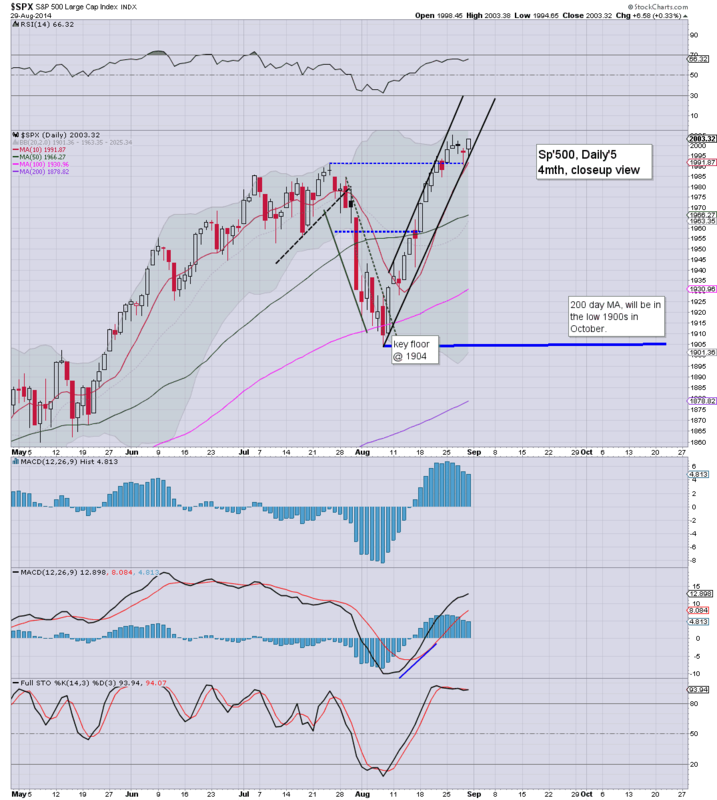 I am VERY open to a short/mid term top in mid/late September, somewhere in the 2030/50 zone. Problem is..I still fear a pull back in October might only be 3% or so. *I hold long across the weekend, via SDRL, (almost back to flat, after the post earnings miss). Will hold until next Wed/Thursday, seeking 38.50/39s. 3.39pm... Indexes all currently fractionally green... and with the 3.33pm howling out of the way.. market looks set for melt higher into the close. US equities continue to quietly churn ahead of a holiday weekend. 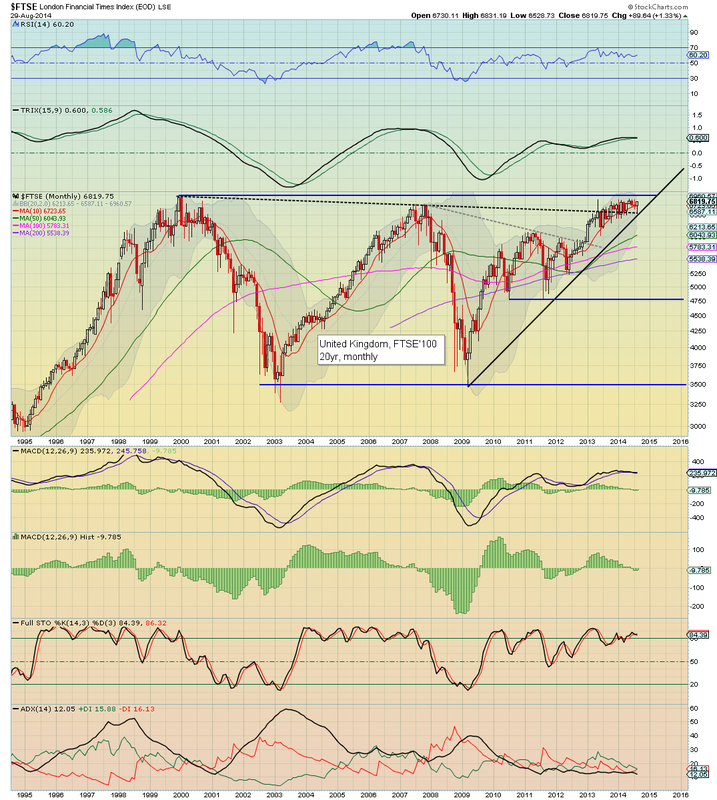 The sp'500 looks set for a monthly close around the giant 2000 threshold. 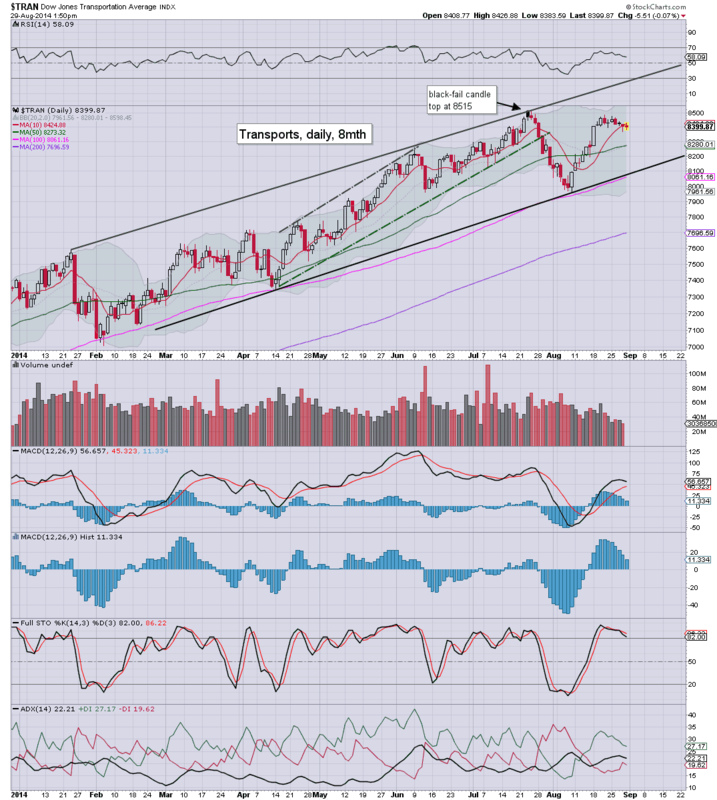 The 'old leader' Transports is offering a 2 week bull flag.. with the 8500/600s next week. US indexes are holding minor net gains, with the sp'500 hovering around the giant 2000 threshold. 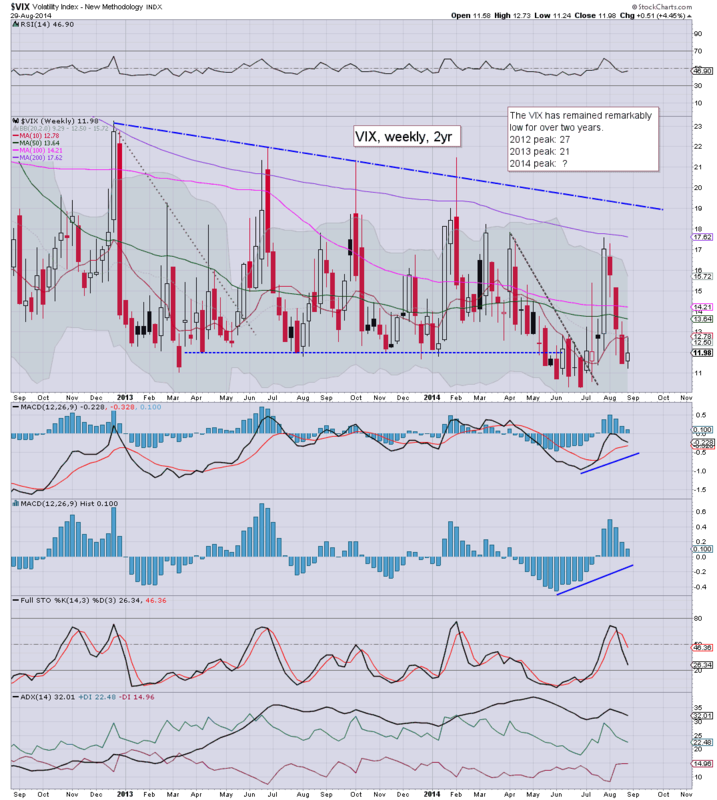 VIX is +1%, but will likely get knocked back to negative into the monthly close. 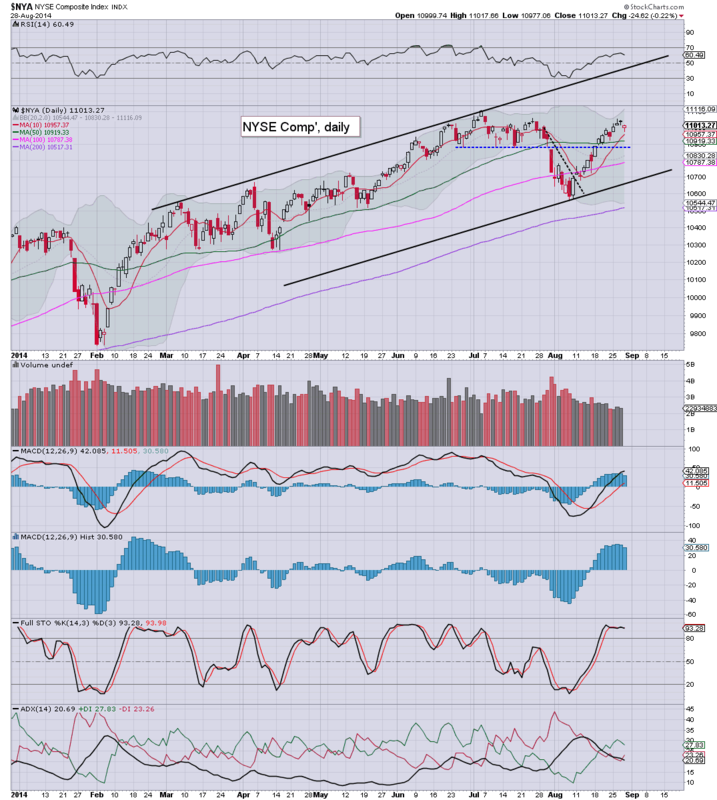 All indexes look set for another net weekly gain. For the sp'500, that will make for the fourth consecutive gain..pretty impressive..and we're almost a clear 100pts above the 1904 low. 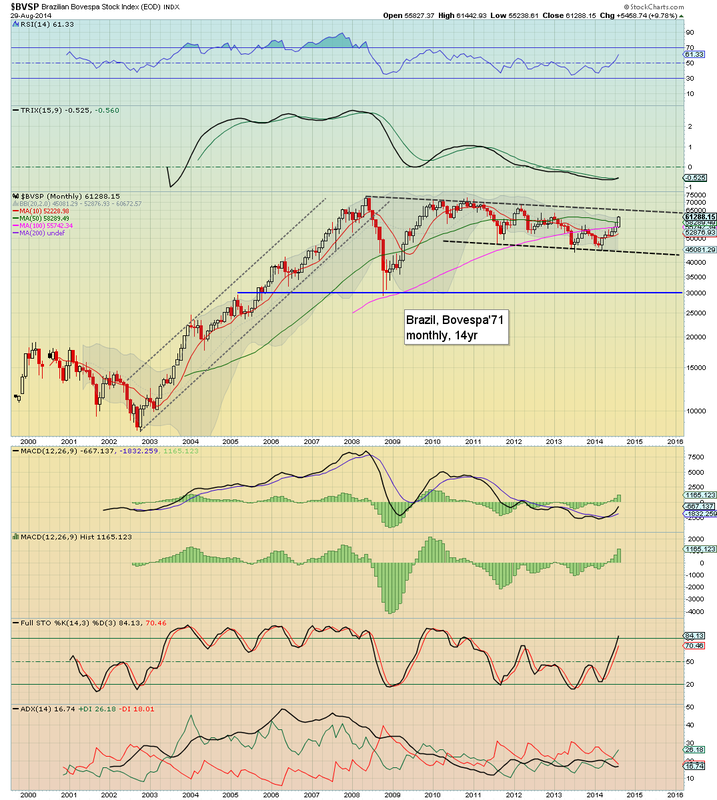 Weekly MACD cycle will turn positive at the Tuesday open.... the 2020s look an easy target. With no 'spooky news' this morning, the bears have zero downside power, and market is back into slow algo-bot melt mode to sp'2002. 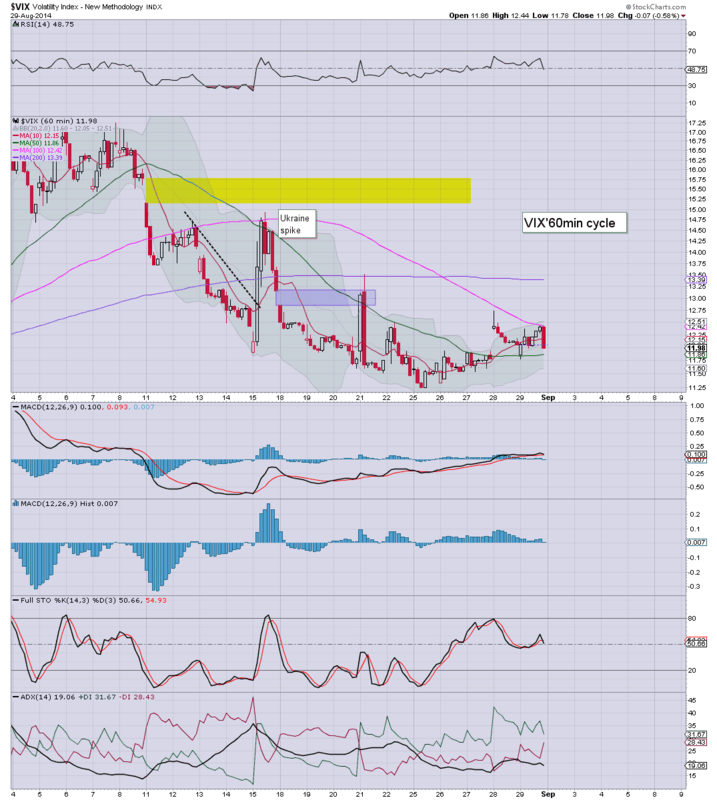 VIX is a touch lower...set for a weekly close in the 11s. Metals remain a touch weak, Gold -$2. Equities are back to flat, and look set for micro chop across the rest of the day. With the Chicago PMI coming in at a very strong 64.3, and consumer sentiment at 82, there is little for the econ-bears to tout. Sp'2020s look very likely next week, if the ECB can placate the QE needy markets. US equities open a little higher, back above the giant sp'2000 threshold. 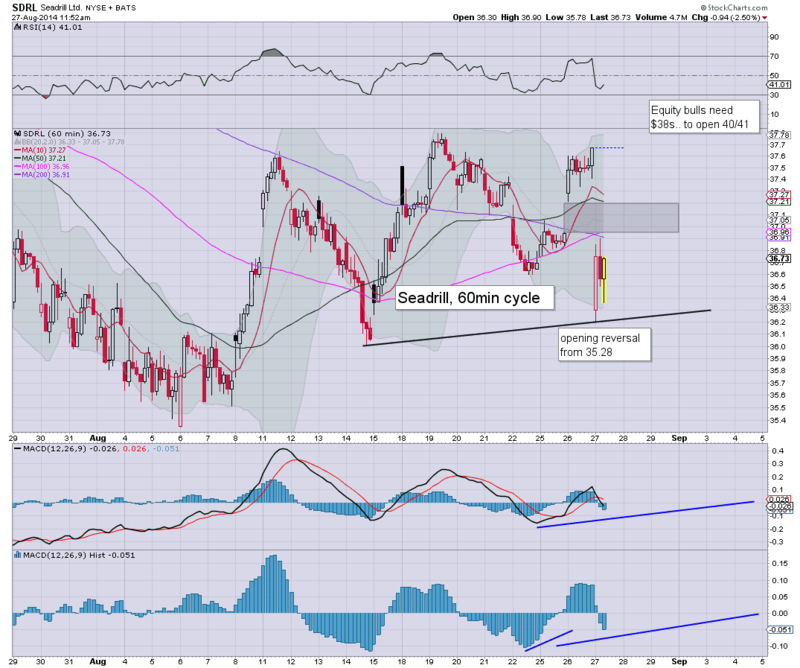 Hourly cycles are offering upside into the Friday/monthly close. VIX is melting lower, with a likely close in the 11s. Metals are weak, Gold -$3, and that is not helping the miners. 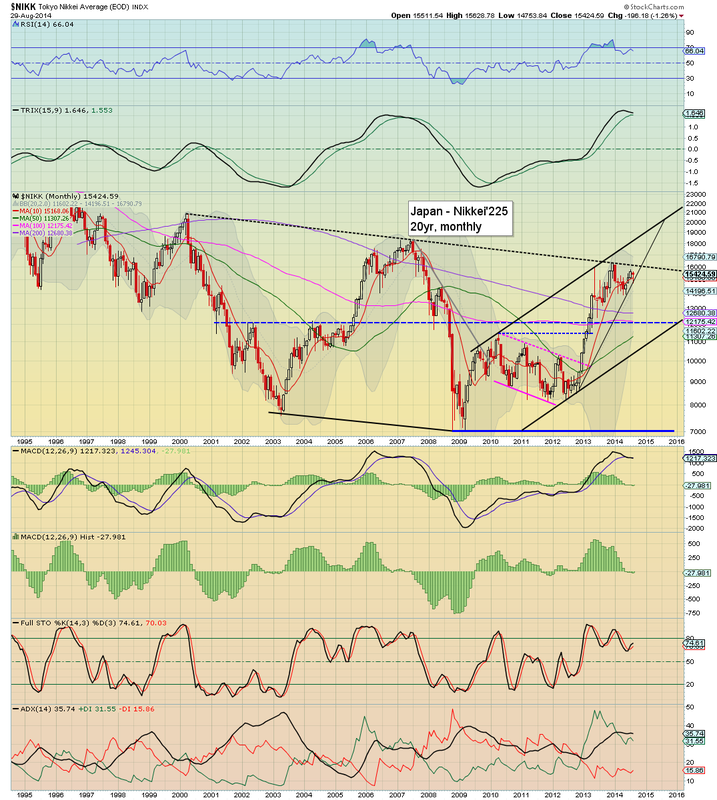 *Most notable, the upper bollinger on the daily, now in the 2020s. Consider that the weekly cycle is also offering the 2020s... it seems a viable level next week. 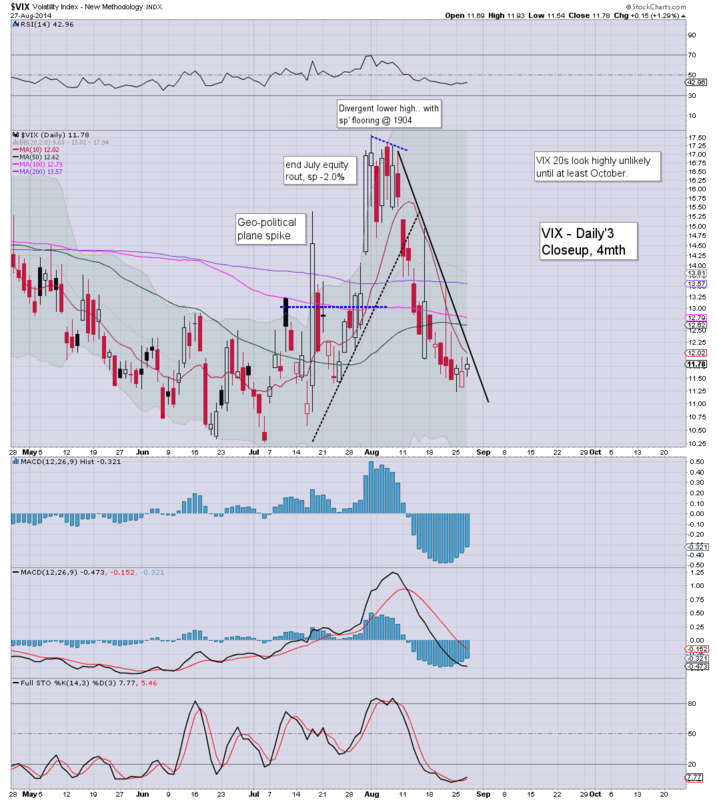 As things are.. we have opening gains... failing.. .and a reversal candle on the VIX. The problem for the bears... barring a sporadic 'spooky' news headline... just where is the downside power going to come from? At best.. 1985/80...if that... and then up next week. 10.33am.. sp -1pt..... exciting huh? Really, for most, nothing to see here today.... turn off ya screens...and enjoy the last days of summer. Good morning. Futures are moderately higher, sp +5pts, we're set to open at 2001. Metals are a touch weak, Gold -$4, whilst Oil is +0.3%. 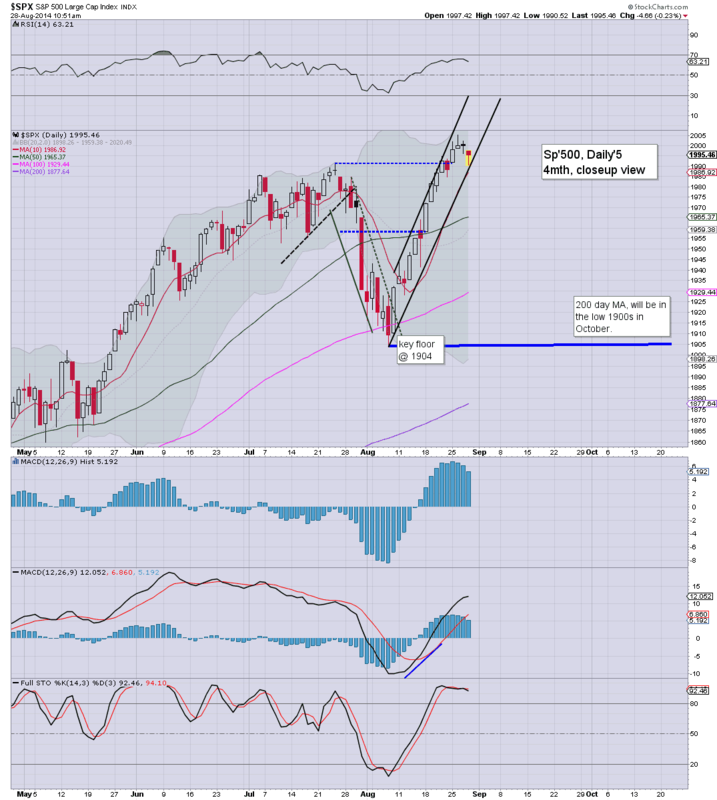 Equity bulls look set to close higher for the fourth consecutive week. *awaiting a trio of econ-data, most notably, Chicago PMI @ 9.45am. So..we're set to open back in the 2000s. Whether the bull maniacs can attain a weekly/monthly close in the 2000s, it is not really important...would merely be a bonus. Once this mornings econ-data is out of the way, it will likely be a very quiet day..leading into a 3 day holiday weekend. There are of course end-month trading issues, with (I believe) some degree of rebalancing. 9.34am.. Upper bollinger on the daily is now up to 2024..... so..we could easily be in the 2020s next week. 9.45am.. PMI: 64.3 vs 56.4 exp' .. a hugely bullish number... best since May. US equities continued to see subdued trading conditions ahead of the long holiday weekend. 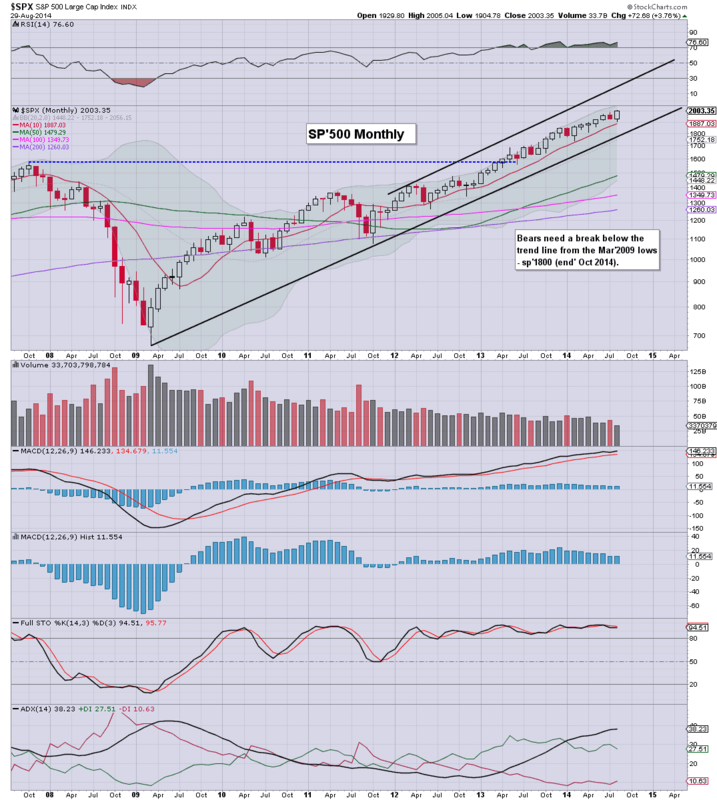 All US indexes are set for powerful net monthly gains, and with bullish engulfing candles all over the place, the outlook for September is for further upside of another 1-3%. Barring some bizarre Friday decline of 25/30pts, the weekly 'rainbow' chart is set to conclude the week with a second consecutive green candle. 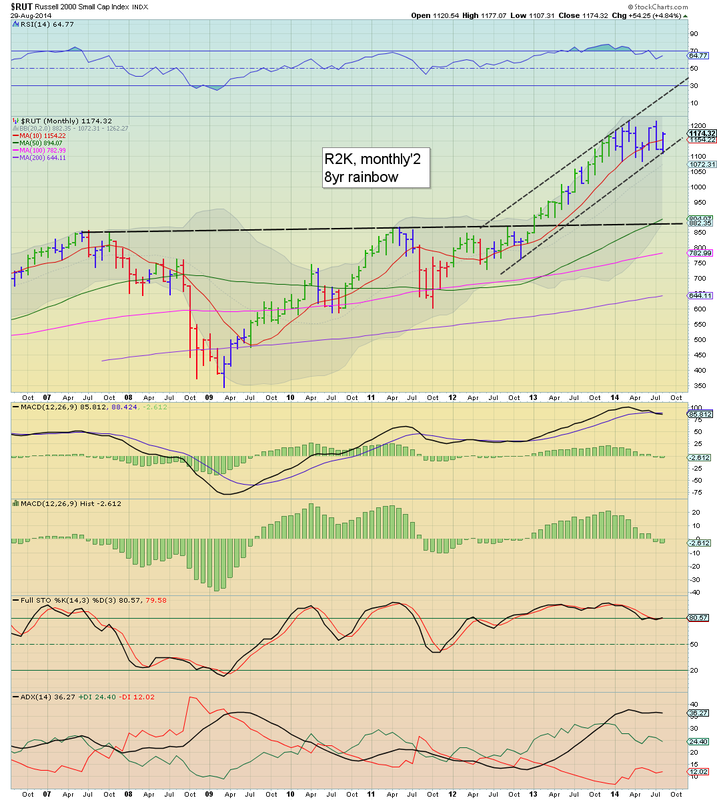 Far more important though, the monthly charts are set to close with very powerful net monthly gains of 3-5%. There is a trio of econ-data to wrap up the week... Pers' income/outlays, Chicago PMI, and consumer sentiment. Those should give the market the excuse it needs to either wash out the weaker bulls in another minor down wave to the 1985/80 zone... or just gap right back into the 2000s. 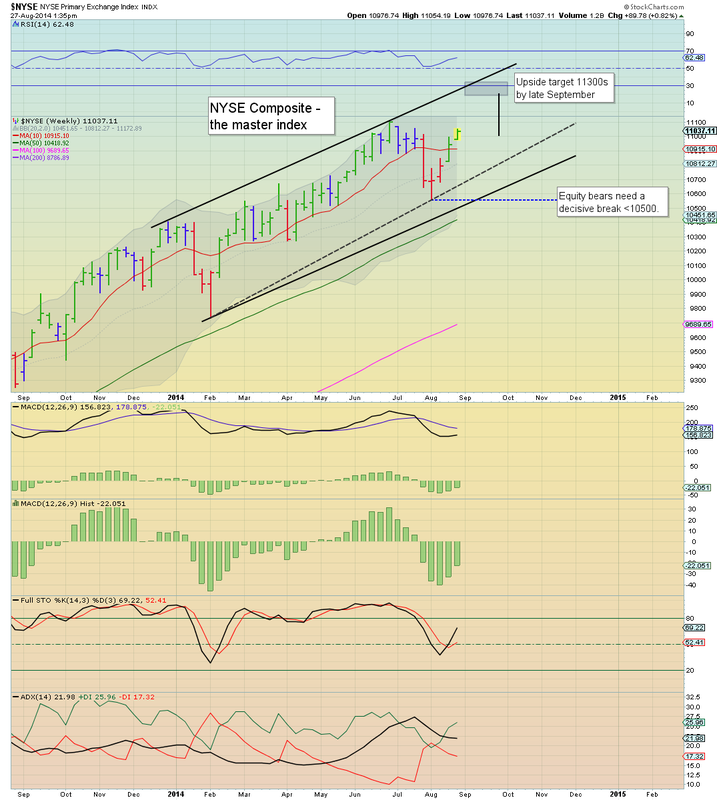 Regardless of any minor moves tomorrow, net week looks set for new highs, into the sp'2010/20s. *the next QE schedule will be issued tomorrow afternoon at 3pm. US indexes saw minor weak chop across the day, sp -3pts @ 1996. The two leaders - Trans/R2K, settled lower by -0.3% and -0.6% respectively. Near term outlook offers 1985/80 for the bears (at best), but with broader upside across September. Another day closer to a 3 day holiday weekend, and the market is naturally very subdued. 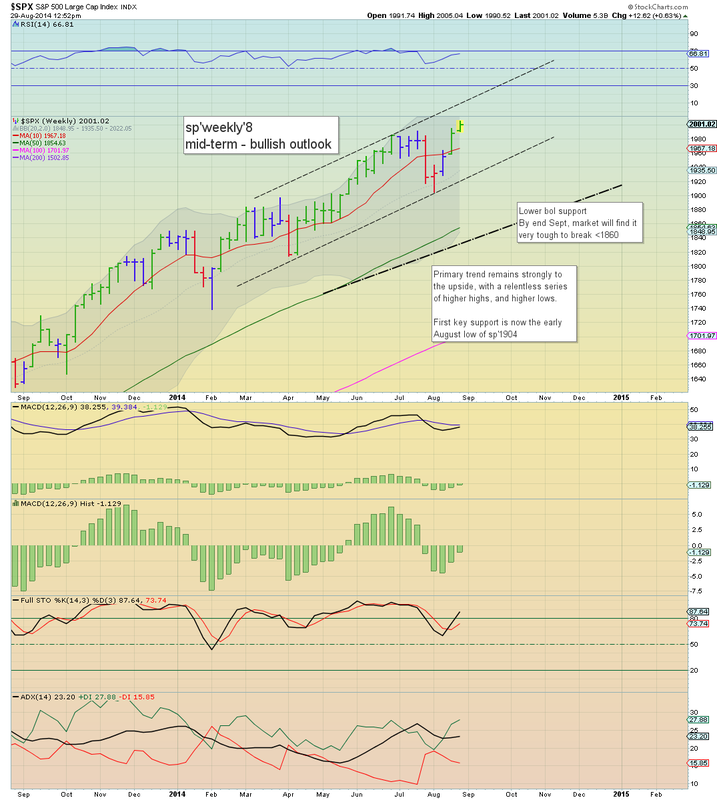 Contrary to what some are saying, whether the sp'500 manages a weekly/monthly close in the 2000s is of no importance. The primary trend remains strongly bullish. 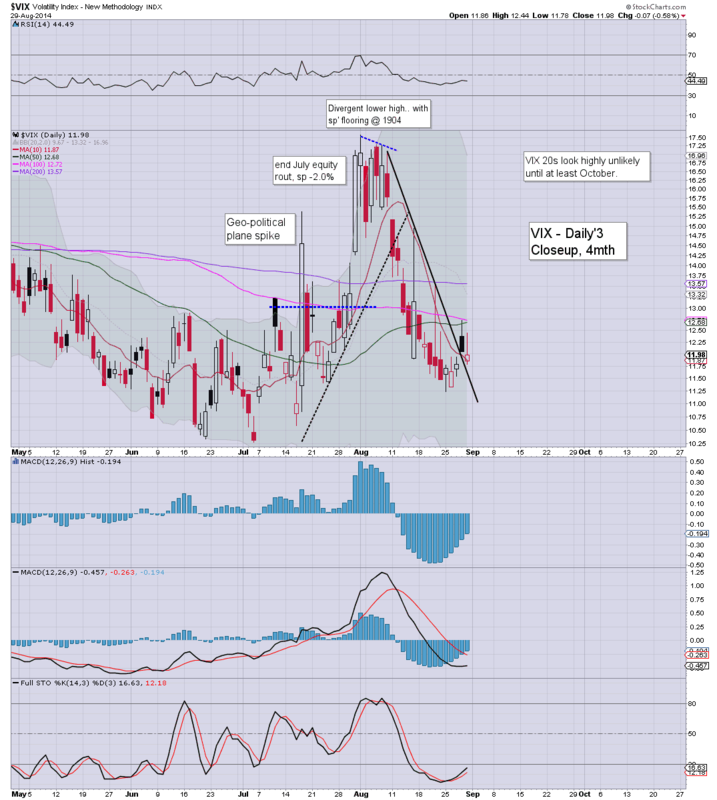 With equities seeing a touch of weak chop in the closing hour, the VIX managed minor gains, settling +1.3% @ 11.78. 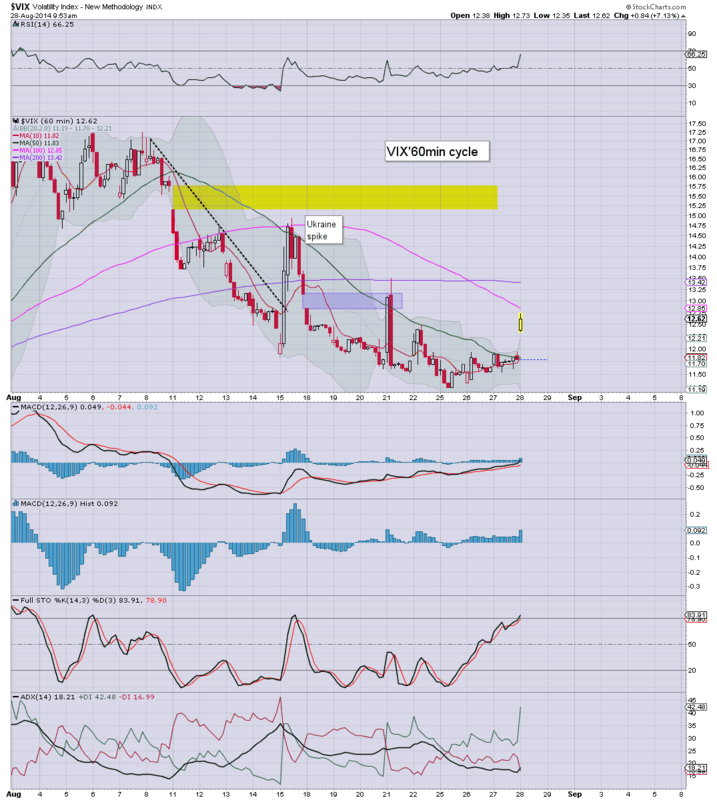 Near term outlook is for the VIX to remain within the 12/10 zone into early September. The broader downward trend is holding, but clearly, there is always going to be a threat of a 2-3 day jump. Underlying MACD (blue bar histogram) is turning upward, but it will likely take another 3 days or so to get a bullish cross, and even then, it could easily fail on the first attempt. On any basis, VIX looks set to remain low for a few more weeks, not least if sp'2050 or even higher. US equities closed fractionally mixed, sp'500 u/c @ 2000. The two leaders - Trans/R2K, settled +0.1% and -0.2% respectively. 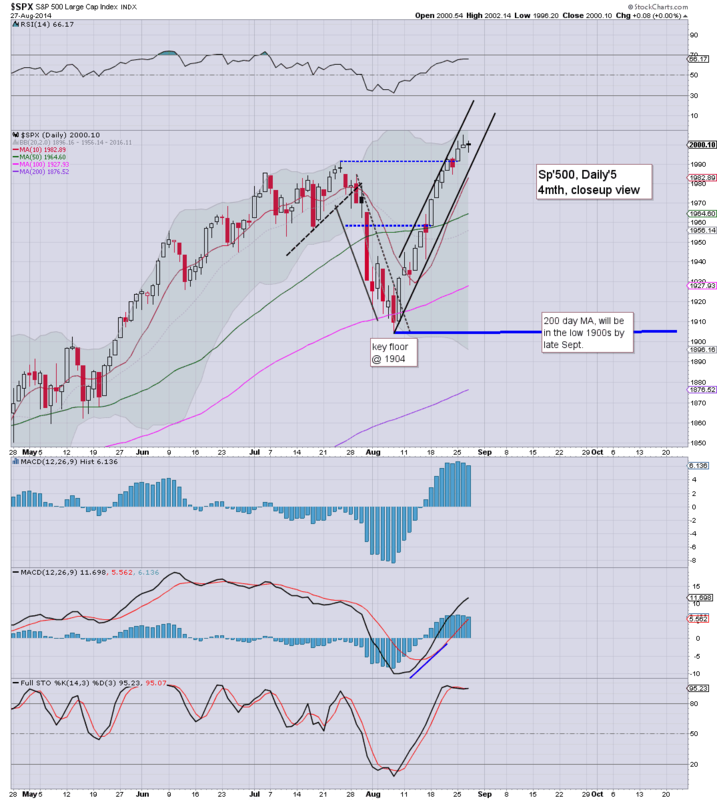 Near term outlook is for continued minor upside into the Friday/monthly close. *price structure is a bull flag on the hourly cycle, and does bode for upside tomorrow morning. ..and another very quiet day comes to a close. Certainly, there were some interesting moves in a few stocks, but overall...it is a market devoid of any decent price action. 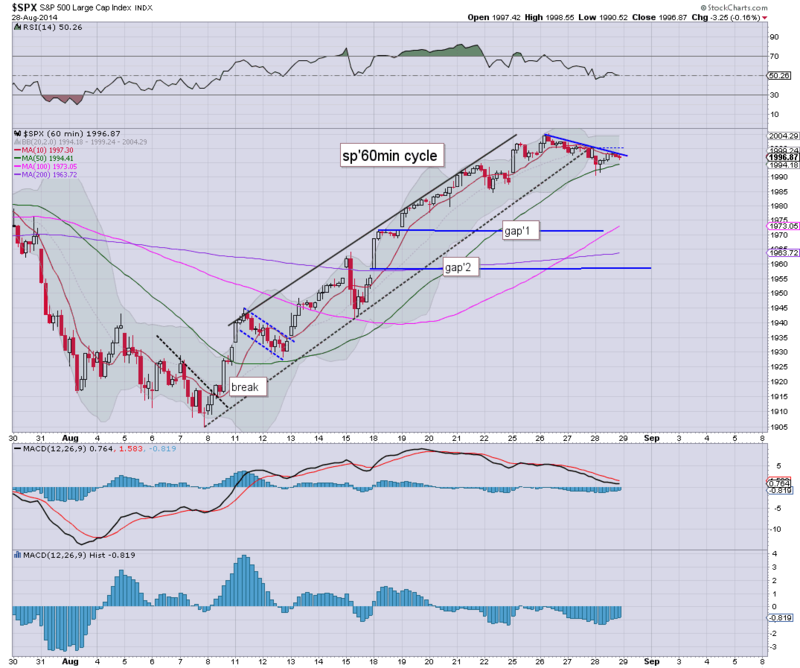 Equities look set for micro melt into the close, after yet another quiet day. 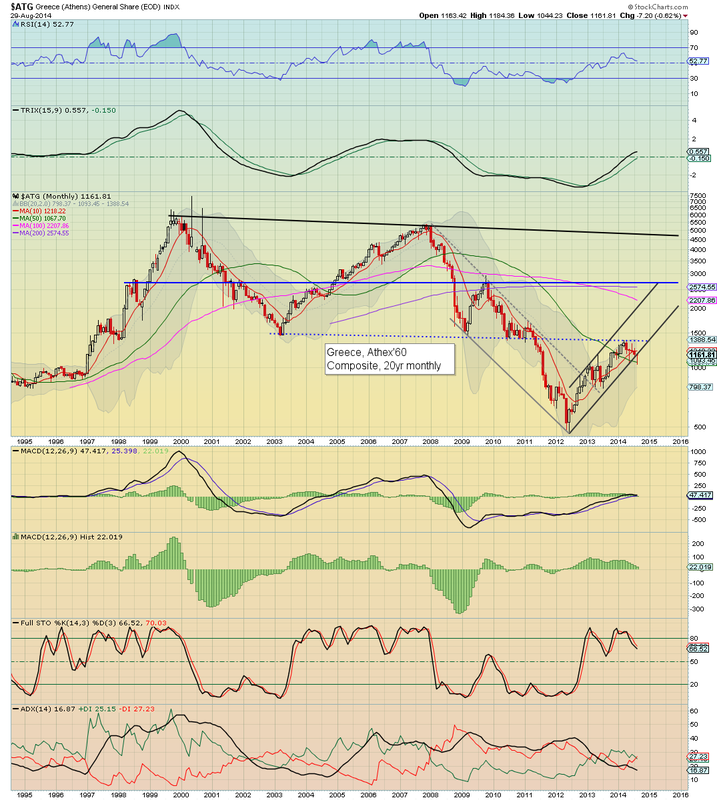 Metals/miners are flat. 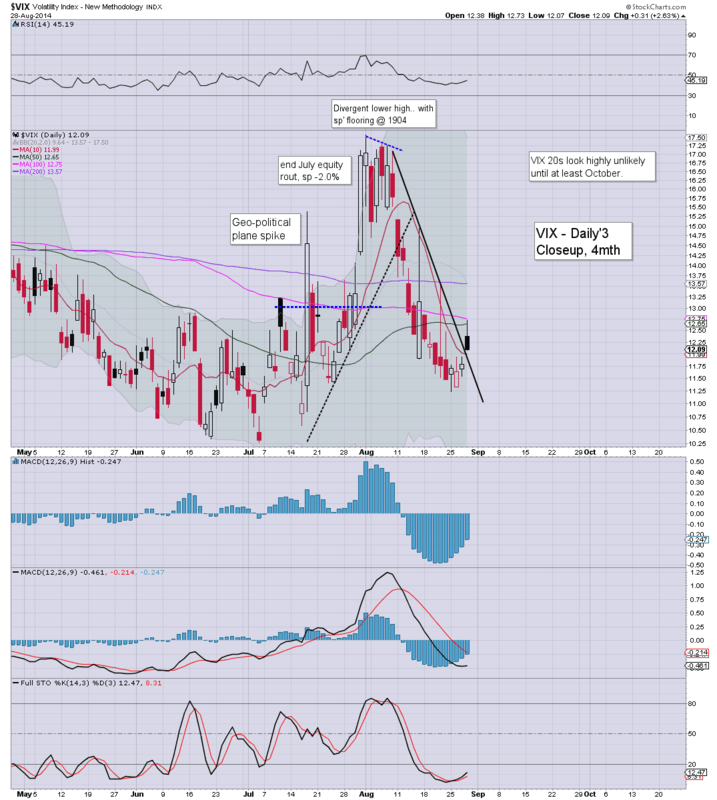 VIX will probably close fractionally lower (why wouldn't it?).. with the 10s as a viable weekly close. *hourly bollinger bands are getting super tight.. 2003/1996. Usually suggestive of a break..one way or another. 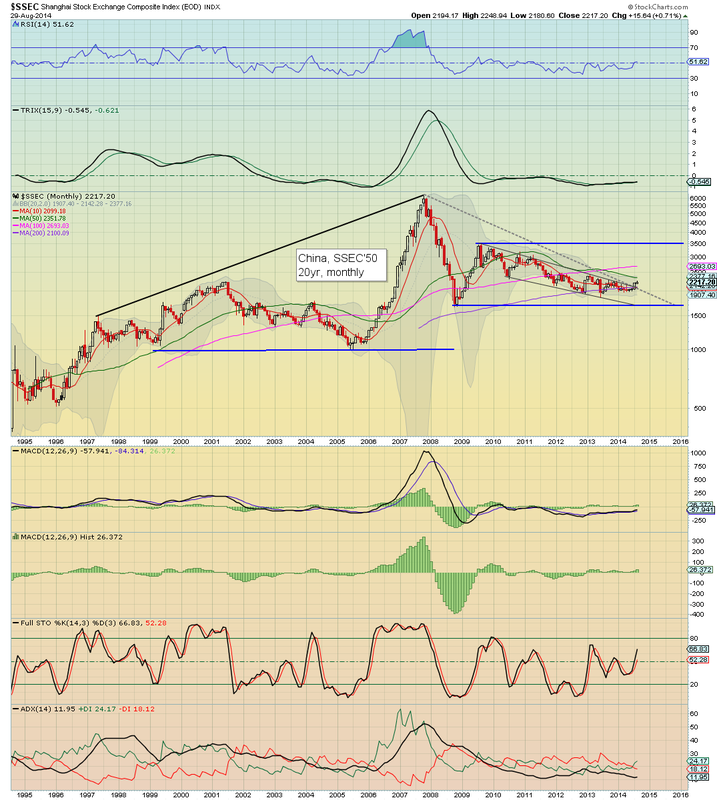 Considering the broader trends..the Thursday break would be to the upside. No reason to expect much price action in the closing hour for the main indexes. As for tomorrow, it will largely depend on how the market deals with the revised GDP for Q2. Even if the number if revised a little lower, with such low' volume...will anyone even notice? 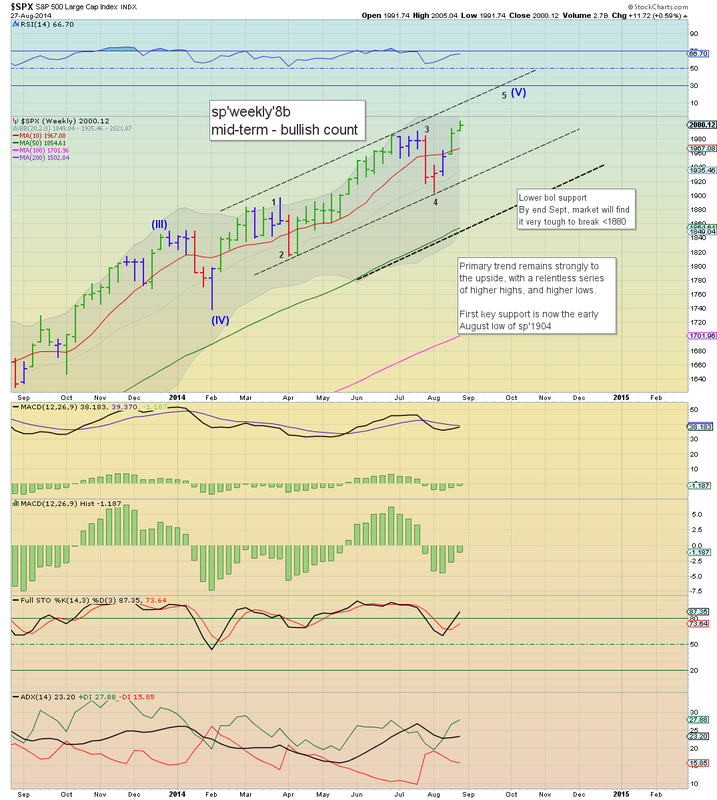 Overall.. market looks set for minor upward chop into the Friday/monthly close. 3.43pm.. price structure on the 15/60min cycles... a bull flag. I realise some are still calling for the 1980s..before 2050... but still..we look likely to close the week in the 2010s..with 2025/30 next week. US equity indexes are holding very minor gains, on what is yet another very quiet trading day. The NYSE Comp' is +0.1% in the 11030s. There looks to be viable upside to the 11300s in September.. which would equate to sp'2050 or so. The 'master index' is comfortably holding the 11000s again.. another 3% higher really isn't expecting too much within 2-3 weeks. *I've eyes on SDRL of course, a daily close in the low $37s would be somewhat useful to clarify a reversal. US equity indexes are all fractionally higher, with the hourly cycles offering upside into early Thursday. 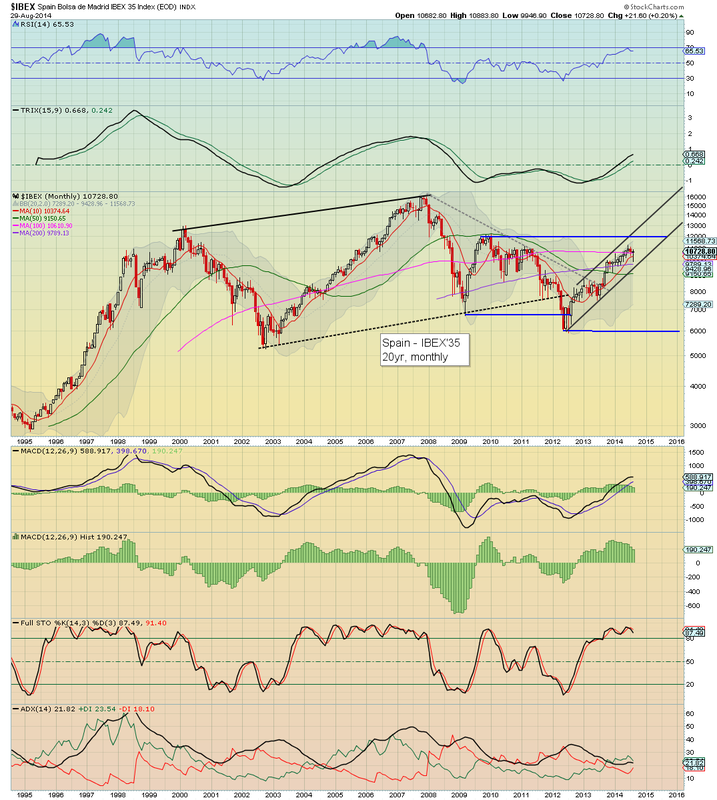 A Friday close in the 2010s remains a very viable target.. which would really setup Sept' for the grander target of 2050..or so. I really should go cook.. back at 2pm. *SDRL is continuing to battle upward from the morning low...a green close? Rest of the sector is strong..so.. that will help. Since the key low of sp'1904, in each of the natural down cycles, the best that the bears have managed is to churn the market sideways for a few hours. US equities look set to continue clawing higher into the weekly/monthly close. There really isn't much to add. A few points down.. that appears all the bears can manage. No news is 'good news' right? Rather the usual 2 steps up.. 1 down..its now a case of 1 up...sideways....then up again. It is all rather tiresome, and for now, essentially pointless for the bears to get involved. 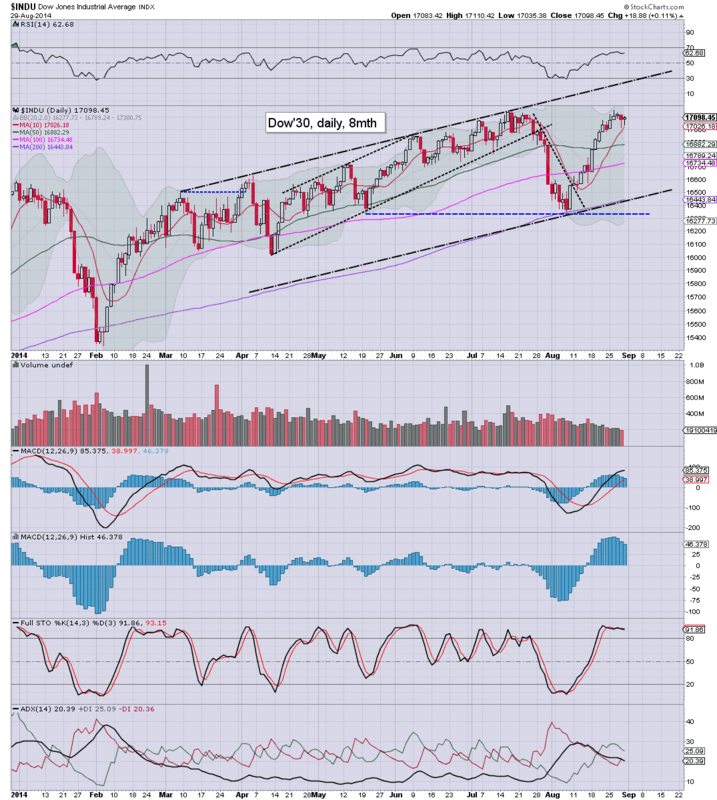 The big issue is can the market hit the upper bol' in September, but that will likely be in the 2060/70s?